The street winds its way through the hills on the banks of the lake Zêzere. The sun occasionally peeps through the leaves of the eucalyptus forest that smell like essential oils from the rain. Beyond the last curve in the road, the view opens up to the horizon: rolling hills and the blue lake glittering in the sun. During the day it is this postcard idyll that leaves a lasting impression, at night it is the silence. When it gets dark, the stars shine so bright and clear, that the Milky Way looks like a sparkling ribbon racing across the sky. The quietness is penetrating, only sometimes there is a cat meowing, voices in the distance or the sound of the small waves gurgling against the bow of a fishing boat, on its way home. Lago Azul is one of those rare places in Portugal, that are not flooded with tourists, unlike Ericeira or Costa da Caparica where surf vans are very common. 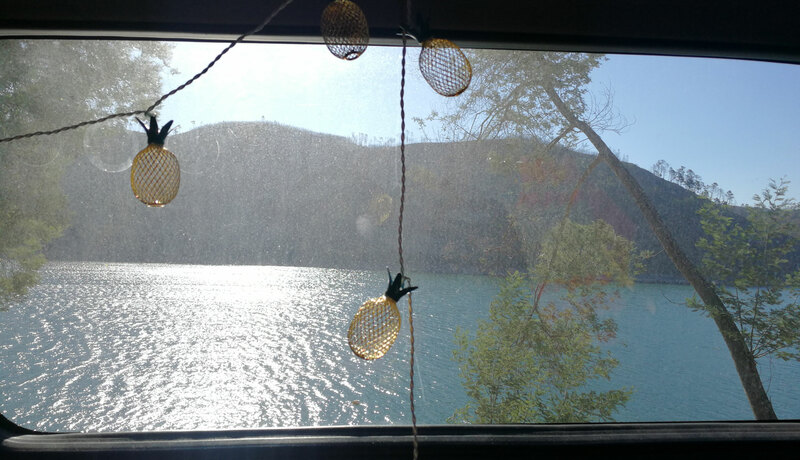 When I open the door of my bus at the blue lake, it seems that I am the only one having slept here and being woken early by the rays of sunshine. Only a few steps away awaits the Maven Café with steaming coffee and fresh watermelon juice. The cable park Lago Azul is located only around one kilometre further south. Hip-Hop beats blast from the speakers, as I walk down the stairs. A young portuguese girl, Joana, sits with her pulled up socks, in skater shoes on a futon carelessly taking a drag on a cigarette. 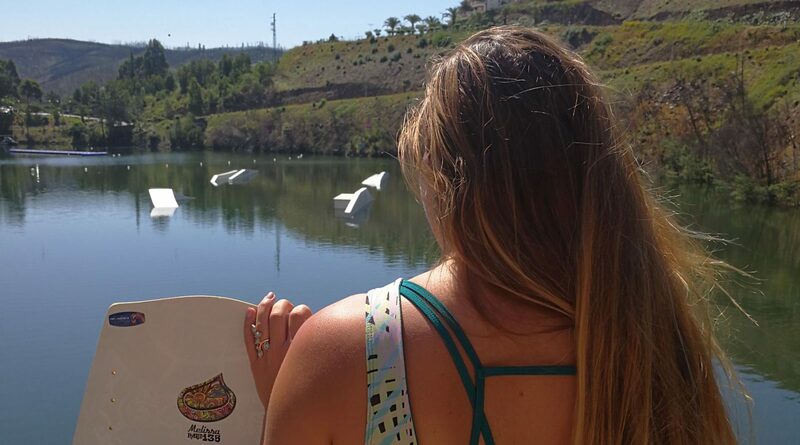 Portugal is a paradise for wakeboarders. There are eight cable parks and plenty of options to ride behind the boat. Professional wakeboarder David O’Caoimh thinks Portugal is the best place in the world to wake behind a boat. “Traditionally Orlando and other places in Florida are ‘the best’. However, the Lago Azul is the best place in the world when it comes to riding the boat. 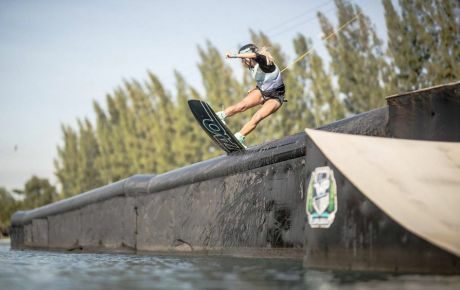 “Side Wake at Lago Azul have the most state-of-the-art boats, the calmest water and amazing coaching to help progress,” states the Irish rider that finished first place in the European Pro Tour in 2018 – of course in Portugal! 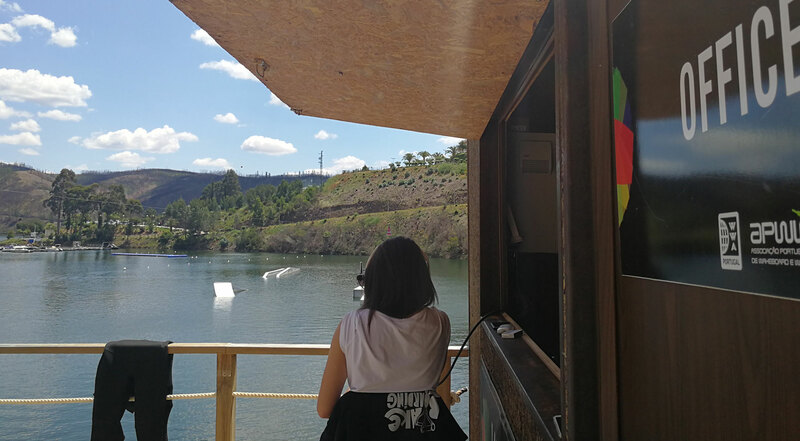 Despite the excellent conditions, estimates of Wakeboard Portugal calculate there are only about 500 – 1,000 active wakeboarders in Portugal, riding more than four times a year. 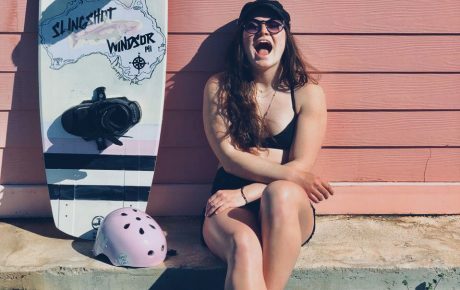 By comparison, in the USA, there are around three million wakeboarders according to stats provided by the Outdoor Foundation. The figure of 1,000 constitutes an all-time peak. 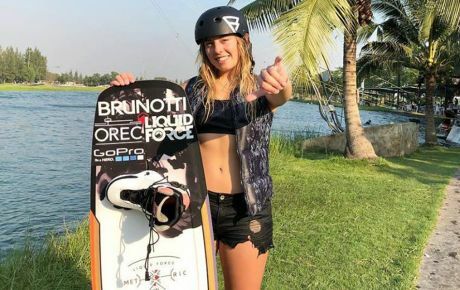 Within the last four years the number has grown a lot, due to competitions that the world wakeboarding association has organized. In 2015, the world championships of the WWA were held in Portugal, for the first time, outside the United States of America. In 2018, the event Tomar Pro offered a new and exciting challenge for pro riders like Matty Muncy, Guenther Oka, Bene Tremmel, Liam Peacock, John Dreiling and many more. 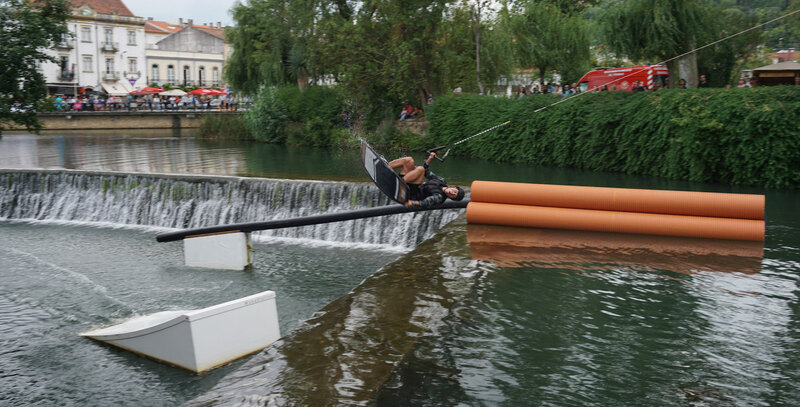 The cable park for this competition was built on two levels in the historic center of the small city of Tomar and attracted a big audience. Until today, Ermal is the only Full Cable in Portugal. 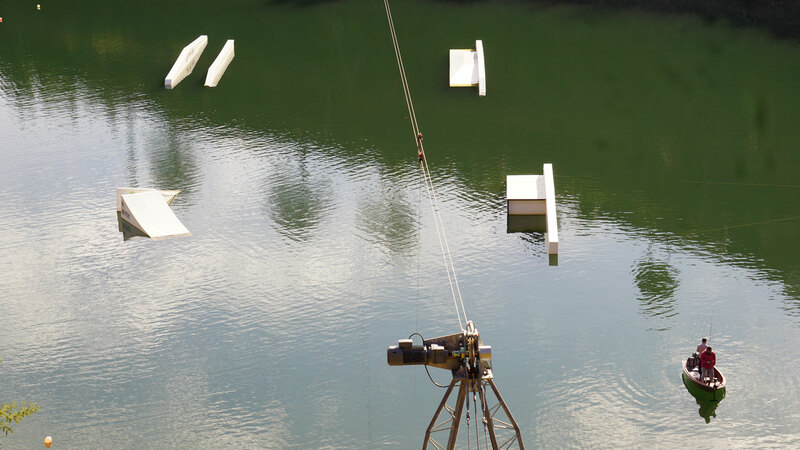 In 2014 the Furia cable park, a 2.0 system close to Porto, opened its gates. This was followed by the Wake Salinas in the Algarve, and in 2015, several cable parks followed in the water reservoir Castelo de Bode. The cable parks extend along the blue lake. To reach them, one has to climb serpentine roads and advance into untouched areas of Portugal, small villages like Trízio, Vila de Rei or Fernandaires, where the world seems to be ok. “I think my favorite part is just the good vibes and the nice people. Everything is much more chilled and relaxed than things are in Dublin where I live!”, says David O’Caoimh. Castelo de Bode is steeped in history. The lake is actually the dammed up river Zêzere, a tributary of the Tejo that has its source in the mountains of Serra da Estrela and is being held back from the river dam Castelo de Bode to become the biggest reservoir of freshwater in Portugal. The dyke was finished in 1951, the water rose and buried productive land where until then corn, vine wreaths and olives were growing. Margarida Luis, an elderly Portuguese lady, sits in her garden in Fernandaires at the shore and looks at the lake. A high pitched hum suddenly fills the air, the cable starts moving and shortly thereafter, she sees a wakeboarder make his way. The 85 year old is drinking coffee on her patio and observes the action. She is dressed neatly in a blue blouse shorn of a single wrinkle, her grey hair braided into a bun. A careful observer would notice her ramrod straight posture. Gradually the streets around the lake were extended and a bridge was built, therefore the demand for ferry rides decreased. Today the 85 year old lady goes down in history – as the last ferry woman of Portugal. 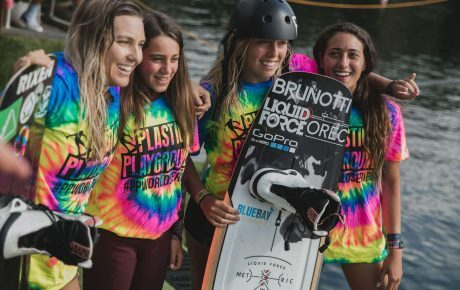 Her grandchildren Andreia Marçal and Sandra Barra keep up then tradition of strong women in a different way: The cable park in Fernandaires was opened in 2015 and is the first one that is operated by women only. The grandchildren of Margarida are in charge here, the house of their grandma located only a few meters away. It is hard to believe how beautiful the area is – and how close it was, that this paradise survived: In June 2017, 156 forest fires broke out, some of them in then area of Castelo de Bode. In total 66 people died and the firestorm was so strong, that the flames spread from one side of the lake to the other. Today only carbonized forest soil and trees are left as a reminder of this tragedy. wakeboarders from the capital need to drive for an hour and and a half to get here. This is not possible after work, you can only go on the weekend – so it’s hard to improve your level.” says João. The problem is the rising cost of land as tourism has grown in Lisbon. 2017 was a record year as 5,3 million people traveled to the Portuguese capital. This trend improved revenue, but there were downsides as well. In 2017 the housing prices in Portugal increased by twice as much as the European average, some of the reasons being the higher demand of foreign buyers. Many Portuguese are forced to search for houses and flats in the outskirts. Visit wakeboardportugal.com for more information.